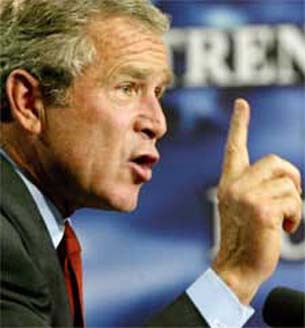 The White House has Announced that President Bush will be making a 5 Nation Trip to Africa. The Tour which will last from Feb. 15th through the 21st will stop in Benin, Rwanda,Tanzania,Ghana and Liberia. But the President is Ignoring Countries that have been Key Allies in such areas as Counter Terrorism Efforts and the fight against AIDS and Malaria such as Uganda, Kenya, Ethiopia and Botswana. Why is this?? After giving the State of the Union the President is going to Africa for a week. So why is he ignoring the countries that are his key Supporters. Kenya has just had a Controversial and Violent Presidential Election which has had a violent Aftermath that has left over 800 Dead at this time. A visit by President Bush could have brought both parties in the strife together. Uganda has been a key player in how the US has been trying to bring Peace to the Congo and has had an insurgency that has used both the DRC and Southern Sudan as a base. It has supplied troops to augment a Peacekeeping Mission in Somalia. Uganda has been seen as a good role model for the fight against AIDS as well. Ethiopia has been a steadfast ally of this Administration. After fighting a war with Eritrea it maintains a readiness there. It also Intervened in Somalia with US Aid to prop up a faltering Government. Botswana is a factor few people talk about. It has been one of the few countries to support the West in supporting a more strict line when it comes to Zimbabwe. It has been one of the few countries in Africa that has not been critical of Africom. It has had problems with AIDS as well as most countries in the region as well. Are these countries being intentionally snubbed by this Administration? Probably Not. But these countries have been steadfast in their support for US Policies since 2001 and this Administration needs to Acknowledge it . So hopefully this will be a successful trip for American Diplomacy.